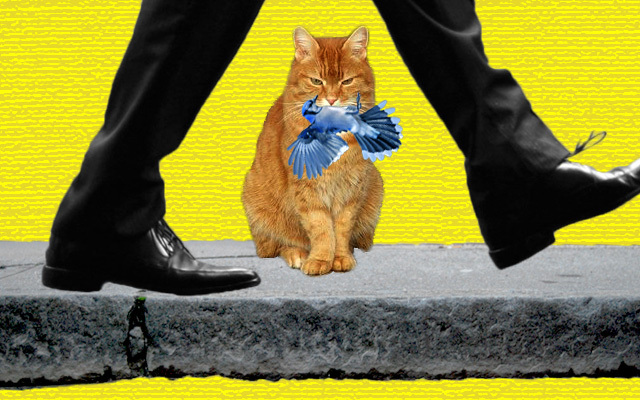 What happens to a nation’s birds when millions upon millions of cats are granted free reign outdoors? The U.S. and many other countries are inadvertently conducting this experiment without doing enough research to determine the result, fueling a heated battle over how to manage the world’s most adored invasive species. With the U.S. Interior Department finding a quarter of all bird species in the U.S. endangered or at risk, bird conservationists worry about the toll outdoor cats may be taking, even if it’s dwarfed by the impact of other threats like habitat loss. ABC argues that birds, people and even cats themselves are better off when cats are kept indoors at all times. But this message meets tough resistance from those who say the millions of homeless cats living among us should be vaccinated and sterilized, not removed from the outdoors. An organization called Alley Cat Allies accuses ABC of disseminating “propaganda and distortions” to exaggerate the damage cats inflict on birds and other wildlife. “There just isn’t evidence that shows cats have any negative impact on bird populations,” said Alley Cat Allies president Becky Robinson. A recent study published in the journal PLoS ONE concluded that the two sides have “diametrically opposing beliefs,” not just about the best management policies, but also regarding empirical statements, or matters of fact. Eighty-seven percent of the bird conservationists surveyed for the study agreed that feral cats contribute to the decline of native birds, compared to just 20 percent of feral cat caretakers, who provide food and medical care for colonies of feral cats. “Their group identities and value differences shape how they view the information that’s out there,” said study author Nils Peterson, a wildlife biologist at North Carolina State University. What’s not disputed is that cats are abundant in the U.S. and many of them hunt birds, as well as lizards and rodents, even if they’re not hungry. For bird conservationists, that’s enough to justify local ordinances banning outdoor cats, given that so many bird species are struggling to survive. But cats are unlike other invasive species, as any trip around the Internet will attest. While the public may warm to the idea of keeping pets indoors, there’s no pretty way to rid the nation of feral cats. ABC suggests that cat advocates build enclosed sanctuaries for feral cats, but in the absence of such efforts, “we do think euthanasia is a responsible option,” Holmer said. Cat advocates want conservationists to show not only that cats are killing birds, including threatened ones, but also that they’re taking enough of them to cause long-term and wide-scale change in bird populations. “There’s a difference between mortality—the death of individual birds—and impact—a change in the population from year to year,” said Allison Grasheim of Alley Cat Allies. Many bird species, it appears, can handle massive losses. In a controversial September 2011 PLoS ONE study, biologists at the University of Minnesota found no obvious correlation between the population trends of bird species and deaths by collisions with communication towers and windows – an even bigger source of bird mortality than cats. On islands, where native bird species hadn’t previously faced mammalian predators, the devastation wrought by cats is well documented. A meta-analysis published last year in Global Change Biology concluded that nine percent of all known bird extinctions worldwide were caused at least in part by feral cats on islands and that such cats threaten more than 15 percent of critically endangered bird species. But since islands are unique in important ways, this evidence is unlikely to weigh heavily in debates over how to manage cats on the mainland. Scott Loss, a conservation biologist at the Smithsonian’s Migratory Bird Center said “the data just hasn’t been collected across a large enough number of sites” to determine how cats are affecting bird populations nationally. Loss added that while it’s not possible to extrapolate far beyond the study sites, some research has shown that cats reduce bird populations on the local level. As habitats become increasingly fragmented by human infrastructure, cats may contribute to a neighborhood losing a bird species, even as the national population of that species remains stable. Determining how cats are changing the fate of birds across the continental U.S. is a daunting task. For one thing, no one knows how many cats are roaming freely. Estimates of the feral cat population are highly uncertain and range between 13 and 90 million. There’s better data for the population of owned cats: an annual survey by the American Pet Products Association puts that number at 86 million, a 34 percent increase since 2000. Surveys conducted in Massachusetts and Ohio suggest that about 40 percent of pet cats are allowed outdoors at least some of the time, but it’s not clear if that figure reflects the entire country. And even if researchers had reliable numbers for the free-roaming cat population, assessing the impact on birds would require a wealth of data on what exactly outdoor cats are killing. On a small scale, scientists have asked pet owners to record or recall the types of prey their cats bring home, but this method is prone to reporting errors. It also misses a lot of kills, according to a University of Georgia study which involved attaching video cameras to pet cats’ collars. A key limitation of localized studies is that while they show cats are a common cause of bird deaths, it’s unclear whether most of those birds would have survived to reproduce otherwise. Some studies indicate that birds killed by cats are weaker on average than birds that died by smashing into windows. The population impact of cat predation is likely smaller than the absolute number of kills might suggest. I was going to say I have never heard such drivel…. but sadly the drivel nowadays, seems to be increasing at an alarming rate, with so many idiotic ideas. Cats causing a decline in the bird population !!!!!! the last time I watched my cats trying desperately to catch a bird I had to laugh in amusement. Shrews and mice yes, they catch those and happily lay them at my feet, but birds? they are few and far between. It reminds me of a cartoon my grandsons loves, simons cat. the cat tries to catch the bird and the bird stays just out of reach and laughingly taunts the cat. And I’ve seen the birds do just that, they sit just out of reach and when the cat struggles to within a foot, the bird casually flies away. Humanity is more to blame than any amount of cats. Trees chopped down everywhere and poisons out to kill the ‘nuisance’ birds. As to the idea of keeping all cats indoors…. cats are outdoor animals… They were created to be outside. It is unnatural for them to be kept inside. I love my cats, I also love the birds that visit my garden. I feed the birds regularly and provide nesting boxes. If I thought my cats were a real threat, I wouldn’t do it. Sometimes nature is cruel, but instinct is instinct. what about all those helpless insect and worms etc that the birds catch… Do we put all the birds in cages then ????? For the record, mortality of shrews and native rodents my cats is a problem too. So the fact that your cat “happily lays them at your feet” is concerning. It’s just that shrews and native rodents have far fewer advocates than birds. Also, as to the argument that “they were created to be outside”, that’s not true in the least. They were domesticated (i.e. created) to be pets, which generally means they live indoors with their owners. So keep them there, thanks.